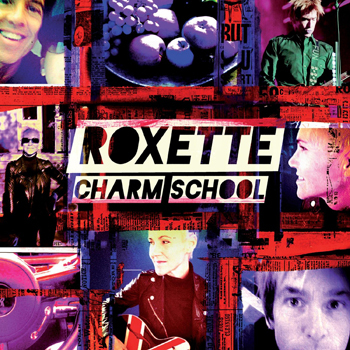 Roxette back with a new album: ”Charm School”! Written by tevensso on December 3, 2010 to Exclusive, Releases and Roxette. Source: d&d management. On February 11 the unlikely becomes reality. After 25 years as a world-famous act with 70 million albums sold, one of Sweden’s biggest pop groups steps back into the spotlight, a decade after their last studio album “Room Service”. They do it with “Charm School”, a new album with twelve songs in a style that’s best described as “updated classic Roxette”, from the initial power pop fireworks of “Way Out” to the bittersweet closer “Sitting On Top Of The World”. First Marie Fredriksson and Per Gessle were reunited on stage to perform “It Must Have Been Love” and “The Look” during Per’s “Party Crasher” tour in Amsterdam. And before the fans knew it, Roxette made a full-scale comeback as headliners during the “Night of the Proms” tour in front of more than 600,000 people in Holland, Belgium and Germany. “By then we started to think ahead and plan for the possibility of making a new album – an album that captured everything that’s good about Roxette while still looking ahead,” says Per Gessle. Said and done. During the tour, the band’s hotel rooms were transformed into recording studios where a string of new Roxette songs took shape. Back home in Sweden, the work continued during the spring and autumn of 2010. Just as when the band recorded during their heyday, there were lots of songs to choose from. The sensitive ballad “In My Own Way” for example, is a rediscovered gem from 1984, when the dream of international recognition was still just a dream. The newest song is the extremely infectious groove-master “She’s Got Nothing On (But The Radio),” written this autumn. In-between there’s everything that has made Roxette one of the world’s most radio-played pop groups; the clinging melodies, the passionate delivery, the humorous pop sense and the unique mix of Marie Fredriksson’s and Per Gessle’s voices. All wrapped up in a musical package that is unmistakably 2011. The album was recorded in the south of Sweden and Stockholm with Clarence Öfwerman and Christoffer Lundqvist as producers (together with Per and Marie). “Charm School” is a magnificent return to form after ten years of trials and challenges. Or as Marie Fredriksson sings in one of the album’s quintessential tracks: ”No One Makes It On Her Own.” Hear the school bell ring on February 11. The day has just got brighter! Amazing news! Wah, it feels so unreal! Oh myyyyyyyyyy godddddddddddddddddddddd!!! Is this real????? I cant’ waitttttttttttttt!! What a amazing day!!!!!!! Ahhhh!!! I love everything about this... the 100% Roxette title of the single, the 100% Roxette title of the album, the artwork... too good to be true already! I CAN’T WAIT ANOTHER MINUTE TO HEAR THIS!!!!! I must say these are some terrible covers, makes HAND look like a work of art. fantastic.....i am so excited about this!! Spread the joy! The Swedish duo is finally back with a brand new studio album!!!!!!!!!!!!!!!!!!!! WOW - I’m feeling 15 again!!!! @ditroia: I like the HAND (and related singles) cover. Not sure about these, because I usually don’t like collages. I’d prefer a simple photo of them in front. With some concept, like they did with “Joyride” or “CBB”. I still don’t get what “Charm School” means, haha. The cover definitely has a Joyride/HAND meets Rarities vibe. I kinda like it! I even don’t really mind the HAND ones too much, though I wouldn’t say I like them. The “One Wish” cover is the worst for me... it just looks wrong somehow. The album cover looks great, is Marie playing a ‘Union Jack’ Guitar on the cover... looks like it! fantastic news, cant wait to hear the single and album but i also would love rox to come and play live for us here in the uk their tour seems to be so full right into 2011 im getting worried in case it doesnt happen pleeeese can someone find out ? Yeah! I have tears in my eyes... Thanx Per & Marie for the incredible news! “Look Sharp” was an album by Joe Jackson. “Charm School” is the next album by Roxette... but the title was used already, by a band called Bishop Allen. @kevSTER - More dates will be announced, and Per recently hinted at a possible UK date on Twitter a couple of days ago! AWESOME!!! I can’t wait to listen to it....I know it will find its way into the internet as a leak sometime during christmas but I am definetely buying the single and the album (although I don’t know if the single will ever make it to my country but I’m crossing my fingers). I am DYING to to have it and listen to it as I have with all previous Roxette albums. It almost feels like Christmas every time there is a new album to unwrap and check what it has got inside. I know Charm School will be a treat to listen to. Kuddos Per & Marie!!! I really like the sleeves. Mostly, I’m happy to see Per & Marie move on from the constant recycling of the CBB/Rarities/Don’t Bore Us era photos. I was so scared the new album’s branding would be 1995 all over again or as profoundly awful as the “One Wish” sleeve that to this day, STILL feels like an internet hoax come to life. I applaud Per & Marie for embracing a distinct look that’s unquestionably Roxette and yet not nostalgic in any way. The art seems to support everything Per has mentioned about this album so far. Can’t wait to hear it now! Loved the cover! Waiting for the TOUR IN BRAZIL!!!! Yep, it’s the press release! for me before christmas we can listening the single at the radio..
Can’t wait for the new album and it’s only two months away. The cover looks like its bold enough to grab peoples attention. Let’s hope the first single gets played on the radio around the world. Now all I have to do is get some tickets to their concert. I’m looking to go in Gotenburg but need some help cause I can’t use my Australian credit card. If there’s someone that can help me out please contact me. Congrats Per and Marie. So much more great news in such a small period of time. More than I ever expected. Here we go, this is amazing! The sleeve is really great and the song titles sound promising!!! Covers reminds me “Party Crasher”/”Silly Really” ones, Marie looks really nice on these 3 pics, but album cover looks more like for a compilation album than a regular album with so many small pictures. Cover is great!! But it seems like a Tour Album Cover!! I hope a snippet of first single come soon!! The date is set perfectly for 14th february. But neither the title ,neither the cover make it good present. Ok cover wanted to show that the album was “recorded” around the world on tour ..
i don’t know , i was hoping for something more beautiful and stylish. Lets hope the album will be all that. Valentine’s Day (Feb. 14) is not that important all over the world. Nobody cares about it here in Argentina. Actually, it was ’introduced’ a few years ago as a ’reason’ to make people waste money in useless presents. I don’t think having a cover that fits that particular day is really relevant. Have to say I really hate the title. I like the cover though. Don’t Bore Us! Open The Forums! I hope the book has many photos, photos from a good quality studio, not like the cover. And like always all the singles lyrics!!!! The best thing to thin th x-mas dinner dancing with the new album!!!! do you know the name of the used font? as a graphic designer i am so glad that the cover artwork is GREAT!! nothing you have to hide and be ashamed (like one wish-cover) at the cash desk ;-) i guess the sound is a bit rougher this time if i “translate” the artwork right. What great news to wake up to!! I’m loving some of the track titles. Still a little unsure of the title and the artwork (looks too messy!? ), but i’m sure it will grow on me. It’s amazing how something like this news can make you feel so hyped up, just like every album announcement prior. yes please open the forum again, please!! Roxette turn on the charm ey? :-p Love the single cover and the title! I really like the title!! The album cover is really good too! But ultimately it’s the music that matters & I’m hoping this will be their strongest album since C!B!B! Can’t wait to hear it!! My only problem is with the song title ”No One Makes It On Her Own” that isn’t proper English is it? Shouldn’t it be “No one makes it on their own”??? Was it a typo in the story?? I wonder if the song “In My Own Way” is the one that Jill Johnson recorded some years ago. Niklas Strömstedt had an swedish version of this one recorded in 89 called “En gång i livet”. Antonio: It’s proper English (and not a typo). “Her own” just places a gender on the song (while “their own” would be genderless). There’s an implied reference being made here that Marie made it through her health crisis with the help of family, friends, and fans who kept her in their thoughts and prayers. I thought that song title didn’t sound right as well. But since when did Per ever worry about little things like that. I think everyone who first read that song title straight away thought of Marie. I Hope the album will be a huge come back! Who cares about the sleeve?!!! As long as the music is a big hit!!! I wanna hear the dj’s say....wow here’s the new number one...Roxette with....she’s got nothing on (but THE radio)!!!! Thanks Per & Marie for your work and for letting us dreaming again! I hope to see you in Italy and feel again the ROX-VIBE in my veins! I am so excited... I loved the album cover, the single cover... can1t wait to have in my hands. Have a great Rox weekend everybody! P.S. Wonder why swedish papers expressen / aftonbladet mention none or so little about this..
Hej it’s just great news, I feel so happy about all this! Nice article as well, but the graphics. what’s going on with the covers??? specially the album cover? Very Roxeteish. I love the cover of CS (is that going to be a name of one of the songs?) and SGNOBTR. BTW tevensson, if you know what the first song is “Way Out” and know the last song “Sittin:g On The Top Of The World”, do you know the other names of the other 8 songs, or hasn’t Per told you yet? Why do Roxette always end their CDs with a ballad? Is it a Per thing? Because you have. So “No One Makes It On Her Own” is it a song or just some lyrics? Is this the first press release where song names are being mentioned? Can anyone help me to find the “fonts” used on the new CD cover??? Want to print it on my t-shirts that I’m gonna wear to Roxette’s shows. I don’t think Per has ever said why, but I love it. The last song on each album are some of Roxette’s best songs. Much the same way that each album starts with an up-tempo song. Hope he doesn’t come out with another freak video for the new single. I miss videos like CBB or LTYH or Run to you! Please Per, let someone else get the idea for the video! Just checked cape town. It seems that the 11th is almost sold out so I guess they added an extra date. That’s awesome. I also read that the concert in Bulgaria was moved to a bigger arena. I do like everything about it but the title.. Corny. Fellow Roxette fans! You can’t imagine how many times the last few years I dreamed about these news! New album AND a tour to my country (greece). They always accompanied critical moments of my life with a new song or an album. This time they do it once more. Their music is connected with my life. Thank you! that would of ate room service! I’ve just had a shriver go up my back and a gut feeling that, This week there will be new dates added to the tour and Australia will be on the list. When I have these feelings, most of them come true. konstpaus, Room Service isn’t their strongest album, i’d place HAND over it, but it still had some damn great songs. MWMLML, LFJ, RS are some of my top Rox songs. The new are awesome! Let’s hope for hearing the single in 2010... And the sleeves seem very nice and different - I think it’s important for Roxette to not repeat themselves after all these years. And maybe these darker hints suggest tough CBB-sound. I also though that the extra CD will be St Petersburg live, after Per’s tweet, but an EP with new songs is also possible, since there’s no non-album song on the first single. The best news of 2010... Now I can start to think about 2011 better... Thanks Marie, you’re my soul since 1994!! my world my love my life is the best rox song ever for me as well!!! after the first minutes of enthusiasm, i am afraid i have to cancel my opinion about the design of the album-cover. i really like the single-cover though but comparing the album-artwork to the other 7 studio album-covers (just look at the classy ’room service’-photo), this one is the weakest and exept for the typography, not very creative or ’fresh’. i can not find a connection or concept between the title ’charm school’ and the photos with photoshop-effects and mix of colors and this kinda destroyed look. i think, a cool photoshooting where the theme ’charm school’ is somehow visible with a creative concept would have ’covered’ the music with a more high quality look. i guess, this design would have been more suitable for an compilation album like “tourism” ... being a graphic designer, album covers are even in times of itunes and ipods still very important to me ;-) however: what counts is the music. and i am sure, they won’t disappoint us, because making great music, is what they are famous for and not designing cool album covers! Good news indeed! I hope to have snippets as soon as possible, but what is it 2 more months after that long waiting period? Now make me happy and come to Spain on tour!!!! @ coyboyusa: you want me to legitimate myself? in my opinion you don’t have to be a cook/chief to say if a meal tastes good or bad ... however: i am a designer for 8 years, i recieved a bunch of international design awards for graphic designs for annual reports, magazines, logos for brand and corporate designs; i work as an art director in a big company and i think i can judge good from average design. for me, the single-cover is good, the album-cover not so much ... satisfied? So they rerecorded “I’m glad you called” I suppose? @joyrider - always loved your designs, but for an album they’ve already done the back-to-back pose. I understand how being in design you tend to pick on things like most people do in their field of experience. Remember the huge backlash about the HAND cover, it’s no where near as bad as that. Hmmm bonus song via iTunes according to the article linked by abysmo?? Hopefully ’i’m really glad you called’ is a new song, or at least a completely revised version, unlike Stupid. @RobS - you’re right, a back-to-back pose would not be fresh anymore for a new roxette album cover. and after knowing the album title, i wouldn’t choose any of my fictitious designs neighter. why? because the design/photo has to transport the title in a creative way. it’s not just picture + text. that is the main problem with the album artwork for ’charm school’, i guess. i miss the depth/connection. a creative connection which is shown perfectly with the ’nothing on’ -sleeve but i’m afraid, i can’t see a concept between ’charm school’ and the pictures/colors/effects. i hope you know what i mean. CHARM SCHOOL en español significa ESCUELA DE PROTOCOLO. Protocol School...so Roxette are going to teach us how to be a good boys and girls!!! Per confirmed that tracklist on Twitter! Thanx PolicarpoAroca!!! Now Charm school makes sense for me. And Escuela de protocolo me gusta!!!!! !XDDDD Gracias!!!! did you know that EMI has financial problems and that there is a chance it could be sold to Warner Music? I hope that the struggle within EMI don’t hurt the promotion as a record company has to invest money in advertisement, promotion video etc. gaga trembles becouse roxette are back and in 2011, there is not for anyone!!!!!!!! Aunque hay muchos medios de comunicación que se han hecho eco del anuncio de la vuelta de Roxette, los 40 Principales han ignorado el tema (yo lo he comentado en su foro). Dado que desde que salió el Room Service el 2001, ésa ha sido la actitud de esta cadena de radio, no estaría de más contactar con ellos de alguna forma y hacer saber nuestras quejas/sugerencias. That’s great News! I’m already excited! Sorry for being off topic, but does anyone has bigger size of the album cover? The bigger, the better. You can email me at [email protected] or just give me the link. Thank you.